In the early 1950s, Triumph was a little-known name in North America, and if they were known, it was likely for their 1800 and 2000 Roadsters, a kind of semi-sporty touring car – you could call it the Lexus SC400 convertible of its day, perfect for a drive to the country club to play a round of golf. As often happens, this car shared its basic bits with a sedan version. Both looked like they dated back to pre-war times, but were in fact manufactured just after World War 2. That said, the handsome razor-edge styling of the Renown sedan evoked the larger luxury cars of its time, while the 2-liter Standard Vanguard engine with 68hp tried its best. 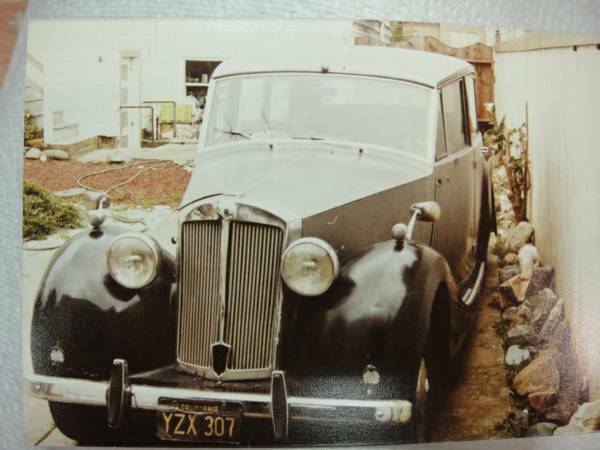 Check out this 1951 Triumph Renown for sale for $3000 in San Francisco, CA. Late black plates suggest the car might have arrived in California in the late 1960s, but could have left England well before then. Either way, the plate looks rather battered in the picture, which seems to date from the late 1970s or early 1980s (check out the classic Tonka dump truck in the shot below). 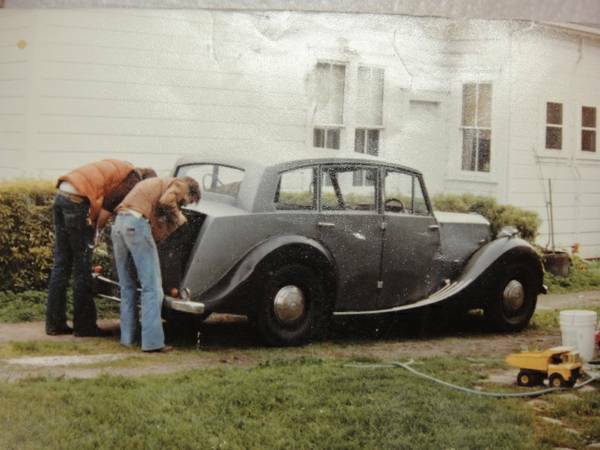 The car is said to be a barn find, one of about 600 imported to the United States – while it doesn’t seem likely these were ever officially imported, it’s a rare car either way. It’s said to require a complete restoration, with no further indication given as to its current condition. The body is constructed of aluminum wrapped around a wooden frame, so brush up on your carpentry, metal-working, and mechanical skills – nearly everything about this car is pre-war, but for the engine and the Vanguard platform on which it was built. According to an A-Z of Classic Cars book published by Classic and Sportscar magazine, only 10 of these remain – would you bump that up to 11? And who determines those numbers anyways? This entry was posted on October 15, 2014 at 4:03 pm and is filed under Feature. You can follow any responses to this entry through the RSS 2.0 feed. You can leave a response, or trackback from your own site.